Gosh, I kind of love stacked foods. Do you guys remember yesterday when I told you those creamy buffalo chicken quinoa bake photos were burning up space on my computer? Yeah, well believe it or not these photos have been burning up space for longer. I have just been waiting, waiting for the right time to share these stacks. See, I made these back in August when most of the country was still boiling hot. But over here in Colorado where I live, it’s never boiling hot. It just does not happen. The weather has been so weird since I got home from Oregon over a month ago. Basically, it has rained every single day. No joke every single day. Loud rumbles of thunder, bolts of lighting, heavy hail and just pretty dark. Which just gives me an excuse to light up my beloved Yankee Candles. My brothers think I am crazy. They say I look like a 70-year-old working on my computer with all my candles lit and the lights off. It’s kind of my happy place. But anyway, the day I made these it was dark and stormy. Oh hey wait, that’s today too. Told you, it really has been storming everyday, but today it is colder. I totally have the heater on me right now. Again, it’s kind of awesome. You know what is also awesome? It all started with thees BLT Corn Fritter Stacks. Remember those? They were epic. Every since then I have wanted to stack any and all food that I possibly can. Stacked food is just better. It’s fun, it’s cute and typically kind of over the top. I love over the top food. Originally, these were stacked to like the ceiling, but then I had to go and get all realistic and take it down a notch. Looking back, I wish I would have just gone all out. Those things were crazy, but so darn awesome. Ugh. My realistic brain needs to shut itself off sometimes. I guess my super stacks would have been similar to a runway show with crazy designs that are really cool but no one would actually ever wear. These are the more sensible version, not to mention way more easily eaten. 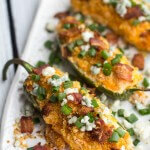 The first step to making these is the crockpot chicken chili con carne. Oh my gosh, so good, This alone is so awesome. You will be so happy for the leftovers the next day. It makes the best lunch. So good. Just throw everything in the crockpot in the morning, go to work, go to school, take a nap, whatever. Then come home and smell the amazingness that is your house! Mmm! It’s gonna smell so good! Then you gotta make the jumbo baked tortilla chips. It’s so easy – promise, and so worth it because you are going to season those babies up. Trust me, it is so good! Then just melt some cheese, stack and devour. Oh wait, but first? First you have to load those stacks up with topping. 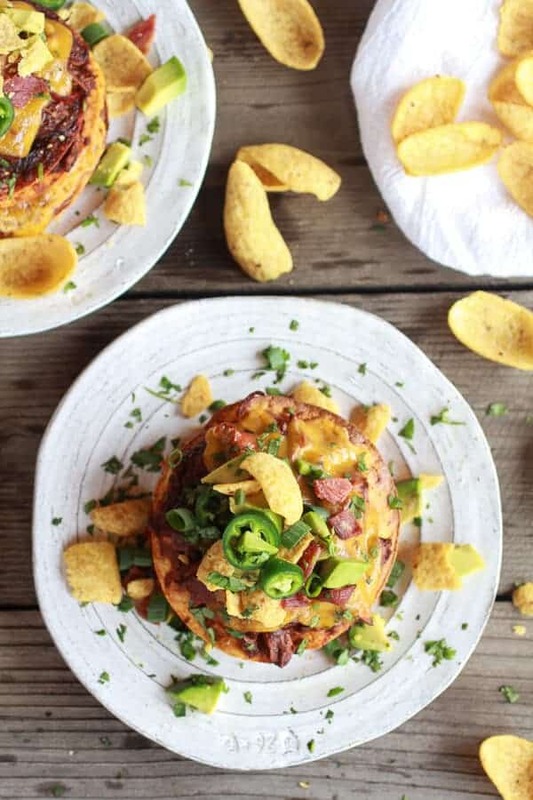 Avocado, BACON, cilantro, green onions, jalapenos, greek yogurt and yes, FRITOS! Just do it. Do it all. Stacked food is just better. It's fun, it's cute and typically kind of over the top! To the bowl of a crockpot add the onion, red pepper and garlic. Place the chicken on top. Measure out 2 cups of chicken broth in a separate bowl, add the tomato paste and apple butter. Whisk until combined. Add the mixture to the crockpot. Next add the beer, diced tomatoes, chili powder, cumin, smoked paprika, oregano, cayenne pepper, cocoa powder, salt and pepper. Lightly stir to combine. Cover and cook on high for 5 hours or on low for 7 to 9 hours. 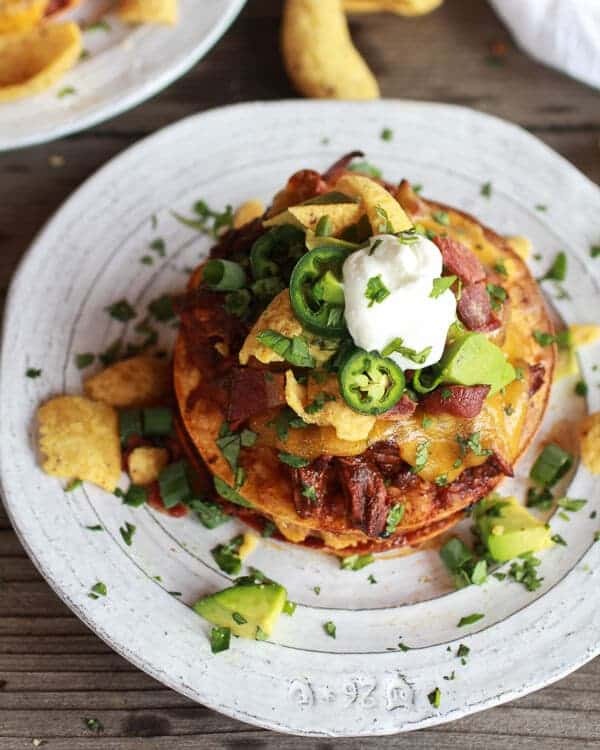 If the chili seems to thin remove the lid and let cook while you make the tostada chips. About 30 minutes before you are ready to eat, preheat the oven to 475 degrees and place a rack in the top of the oven and one right below. In a small bowl combine the brown sugar, chili powder and smoked paprika. Stir to combine. 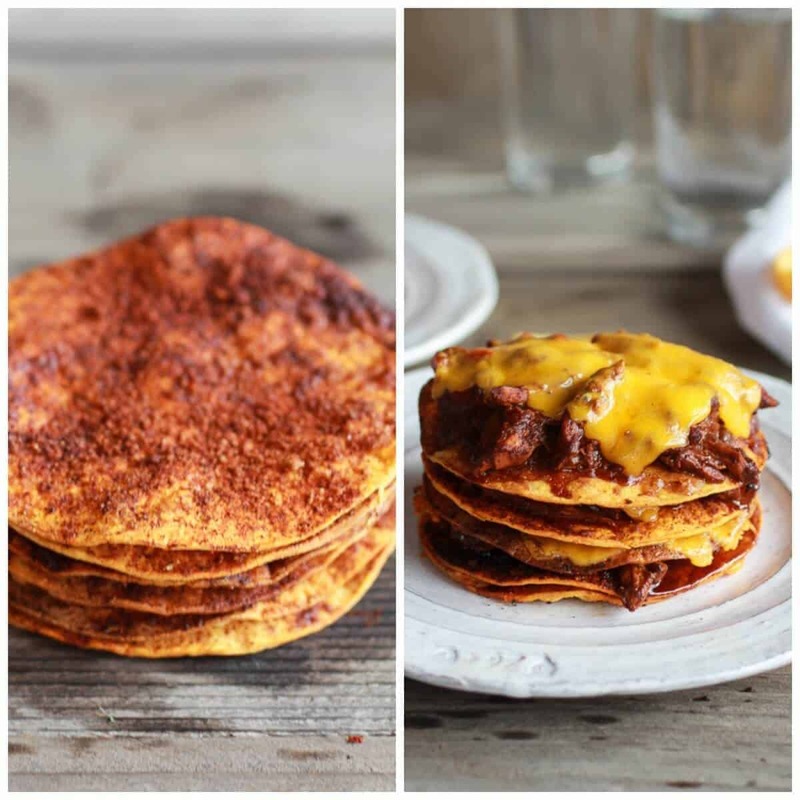 Line the corn tortillas in a single layer on 2 baking sheets. Spray with cooking spray or rub with olive oil and then generously sprinkle on the seasonings. Bake for 8 to 10 minutes, or until the tortillas are just beginning to turn golden brown. Rotate the pans (top goes below now) half way through. Remove from the oven and repeat with the remaining tortillas. Now take 4"chips" and spread each with a little shredded cheddar. Place back in the oven to melt for about 1 or 2 minutes, remove and top each cheesy chip with a non cheesy chip. 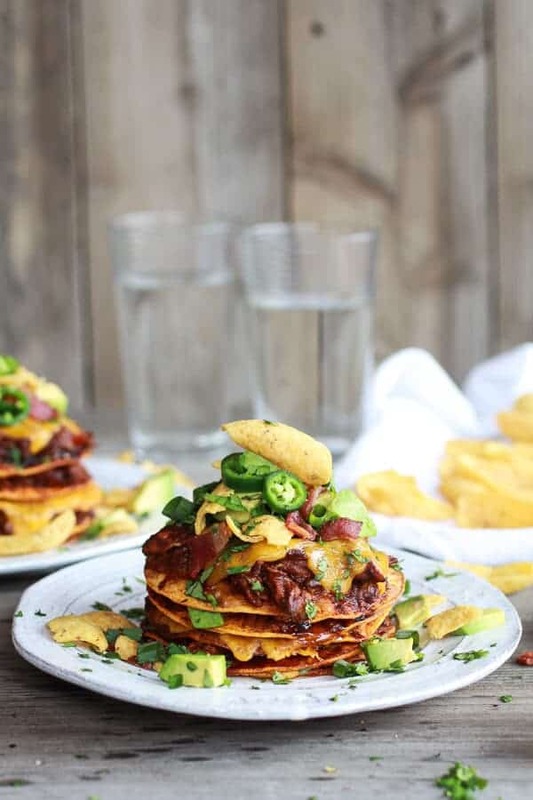 To assemble the stacks, place one plain tostada (meaning no melted cheese) on a plate, spread with cheese and then top with the hot chili. Now grab one of the cheesy chips and place it on top, top that chip with hot chili and them a sprinkle more of the cheese. Finally add one more plain chip, top with chili and more cheese. Repeat with the remaining chips, until you have four stacks. 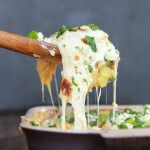 If desire, place the stacks on a baking sheet and melt the top layer of cheese. 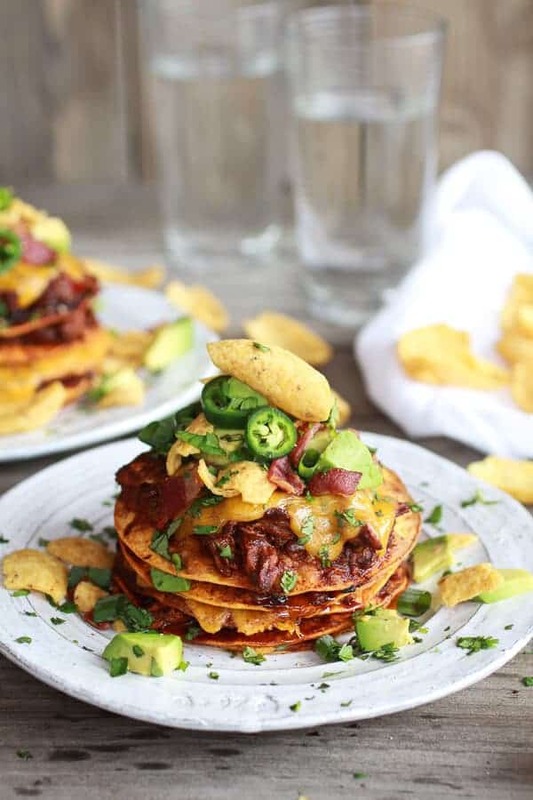 Top each stack with avocado, cilantro, jalapeños, a dollop of greek yogurt and Fritos if desired. Go to town! I’m loving these amazing crock pot recipes! Keep em coming! And stay safe out there in Colorado! Woah. These look beyond amazing. I mean, so saucy and gooey and messy. Which all equals delicious. Hopefully, the weather cooperates soon, be safe! Wow, once again (as always), you’ve manage to create something that I now crave to a ridiculous degree. Your family is SO lucky to be able to eat all these wonderful creations every day! Thanks Laura!! I think you need to tell them that! LOL! 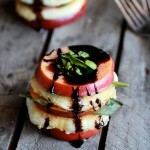 If I could make stack food look like this I would love it too!! I am dying over this tower! Wow this stack is stunning. I’m drooling just looking at all the layers tumbling from stack to stack. I can imagine the aroma that fills the house when this is cooking. 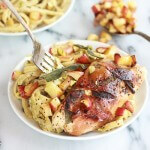 Very creative recipe and nice photo. I can’t wait to try this. I’m sure my family will love it! Thank you so much! I hope you and your family love it! Love it! Perfect for game day! 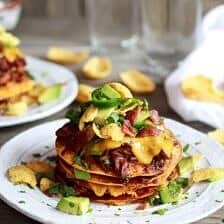 These stacked tostadas look fabulous! And the chili con carne – droolworthy! Thanks Shashi! And it’s ok, I am finding the rain very cozy! I’m without words – these look so delicious! I can’t wait to try them. You are a maniac in the best way possible!!! Pls fly me out to Colorado, thanks!! Cozying up with candles, my laptop and a stack of this fun loving delciousness sounds amazing! Love me that crock pot chicken chili! Grateful the rains have stopped for a bit but then they didn’t really impact me; just hard to see what has happened to so many others in our beautiful state. These are impressive…but I am left wondering. Fork and knife or fingers…or I’m guessing a bit of both! I know, I still cannot believe it. It’s crazy! Thanks so much, Barbara! Oh and yeah, we ended trying the forks, but then just went in with out hands! I made them just for you! No joke, I totally had you in mind when making these! That’s just a work of art right there, Tieghan! Love the stacked presentation. A perfect way to serve a chilli for a dinner party, such dishes are normally so difficult to present nicely for your guests, thanks. 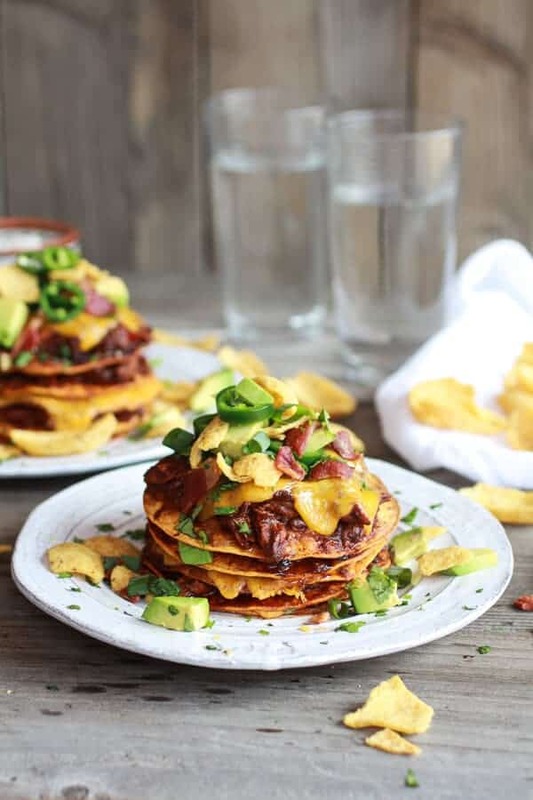 Stacked food is so fun, these tostadas are no exception! Stacked is the best! Stacked cheesiness is even better! Perfect timing! I need to make these this weekend!! Thanks Julie! Let me know if you make them! 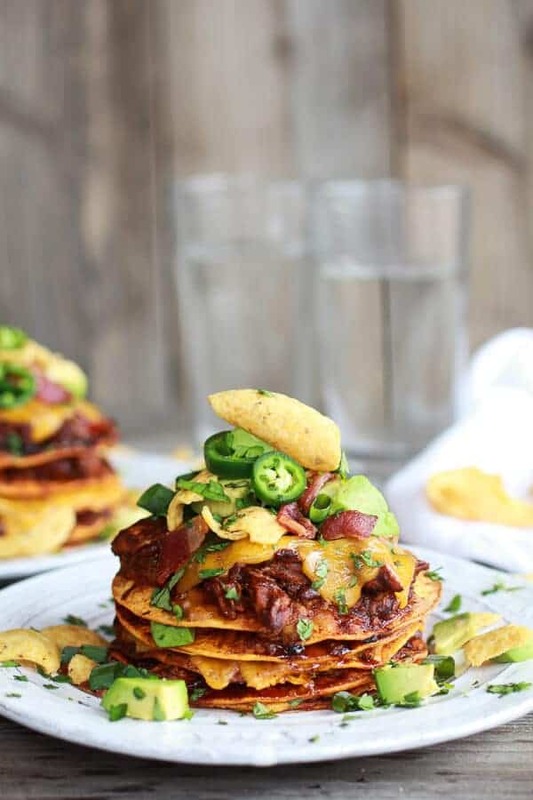 Yes I love stacked foods too! Call me crazy, but I would love to live in a place that rained everyday. I grew up in Texas where it never rained, and now I get so excited when it rains! Haha! It usually never rains here, so I can actually understand! I am liking the cozy rain! 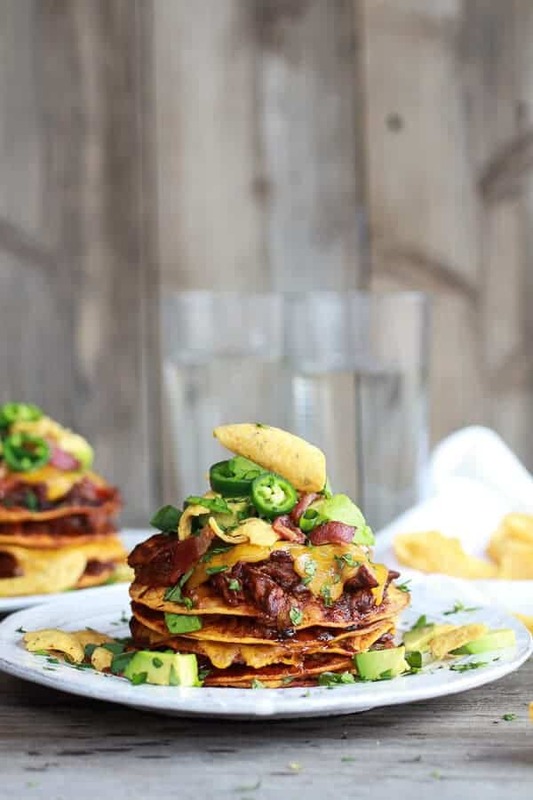 I’ve seen your tostada stacks floating around on Pinterest – they look amazing Tieghan – what a fun presentation and great for football Sundays! CO weather is my favorite! I am a CO girl at heart even though I now live in UT, I can’t get over how much I love the sweet mountain towns and summers and just absolutely gorgeous. WoW. Those nachos. 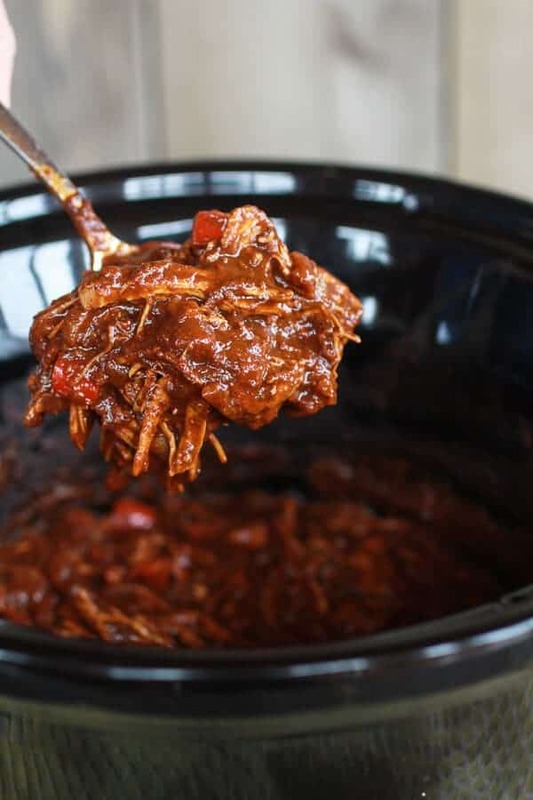 They look so delicious and anything in a crock pot is a winner to me. So dang easy! CO is the best! I love living here!! These look amazing! I just printed the recipe and can’t wait to try them. Thanks for sharing! Oh and your photos are AMAZING as usual! Thank you SO much, Michelle!! Hope you love these! I made this chili tonight. It’s the best thing I’ve made in quite a while. Seriously. Off the charts. My husband and kids love chili over noodles. I roasted some sweet potatoes for me and served the chili over it with avocado and cilantro. Wouldn’t change a thing about the chili. Can’t wait to use the leftovers for tostatas or nachos! Thanks so much! SO happy you and your family loved this!! Thanks for making it and enjoy the leftovers! What can we sub for the beer? Thanks! Does this call for 1 oz or 12 oz of beer? The layout of the recipe makes it unclear to me. Thanks!